1. 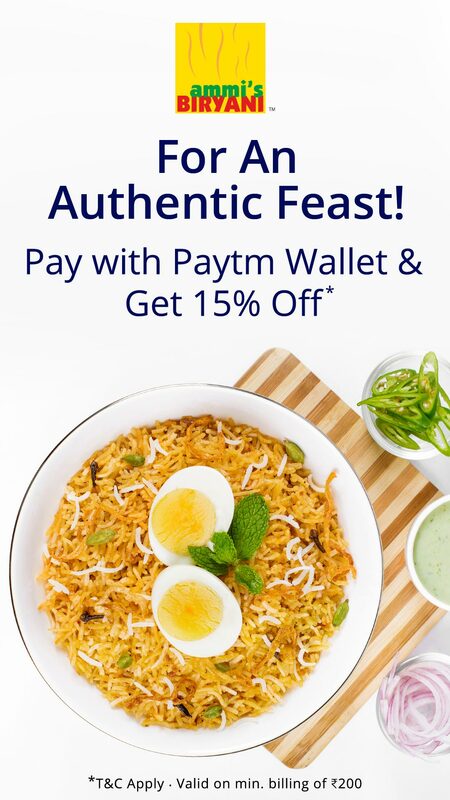 15% off on a minimum bill of Rs 200 when you pay with Paytm at Ammi's Biryani. Maximum discount upto Rs.200 can be availed. 2. Offer applicable on selective outlets. Please check the list below for the outlets. 5.Discount applicable only when paid directly at the outlet. 6. Offer not applicable at kiosks. 7. Discount not applicable on Combos, Family packs and Party packs. 8. Customer needs to show the coupon code at the counter before billing. 10. Discounts will not be processed if the customer does not show the coupon code at the counter during billing. 3. Just show this mail along with coupon code to the cashier at Ammi's biryani to avail instant discount of 15%.